These are two consecutive sections of the high speed platform that are part of the Basque Y on the branch between Vitoria and Bilbao where Azierta has been in charge of the supervision and control of the works. This is a semi-urban area, some 20 km to the southeast of Bilbao and surrounded by remarkable natural landscape in the vicinity of Amorebieta. As the railway runs through an area of ruffed relief, the infrastructure is a succession of tunnels and viaducts. The control and supervision of such works, with huge social impact as a result of the environment where it is constructed, and its purpose, where contrast surveys were conducted as well as the whole qualitative and quantitative control of the works represents an important landmark for Azierta. As it has provided the Technical Services for two consecutive sections, it will become one of the engineering consultancy firms with greater participation in the Control and Supervision of the line. When it is put into service, journey time will be dramatically shortened for all three Basque capitals. The reduction in journey time between Vitoria-Bilbao and Vitoria-San Sebastián, in around 60 per cent and 80 per cent in the Bilbao-San Sebastián line. Besides, the high –speed trail will prevent the emission of 425 tons of CO2 a day, which correspond to the consumption of 27,000 liters of fuel, as well as reduced emissions of carbon, sulphur oxide and other chemical and organic compounds to the atmosphere. This section includes the construction of the Viaduct over the Ibaizabal River (394 m), which has become the railway viaduct with the longest span in Spain executed with movable scaffolding system. With a length of 5030 m the Amorebieta-Amorebieta section is the longer of the two. 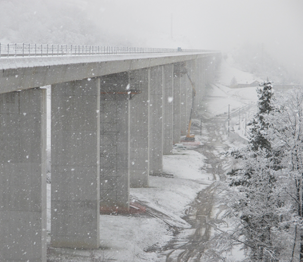 It includes the construction of two bored tunnels, Arteako Tunnel (330 m) and Orranpe Tunnel (505 m) and three artificial tunnels, at Madalén, Erribaso (330 m) and Arizbakarra (385 m). It also includes five viaducts, namely: Viaduct over the Ibaizabal River (394 m), the railway viaduct with the longest span in Spain executed with movable scaffolding system, Viaduct of Leginetxe (261 m), Viaduct of San Lorenzo (117m), Viaduct of San Antonio-Malaespera (840 m) and Viaduct of Arkotxa (163 m). 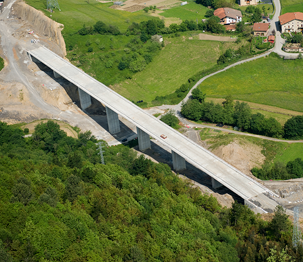 Consequently, 2/3 of the section are viaducts or tunnels. 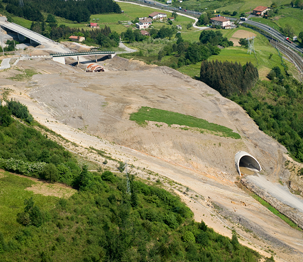 The Amorebieta-Lemoa section is 3,449 m long and 74% of it is a tunnel, to be precise, 2,546 m, consisting of the tunnels of Marrageruena (363m), San Román (778 m) and Ganzelai (1,405 m). 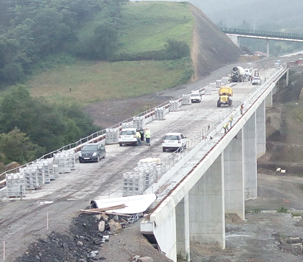 The section includes the Viaduct over the Boroa-Lemoa freeway with two sections of 62 and 52 m long each. In both sections, an important part of the budgets goes to environmental restoration (between 4% and 6%) including preventive and corrective actions.